Things are on the move here. A very well known wildlife artist is going to be exhibiting here at Gigrin in the near future. Next Saturday is the expected start date. Having had an accident this morning that resulted in my being seen hobbling around the yard both in great discomfort and at a snails pace, feeding the kites was out of the question, so Colin stepped forward at 3pm. All went to plan - the kites arrived on time and in good numbers and were still coming in for food this evening. 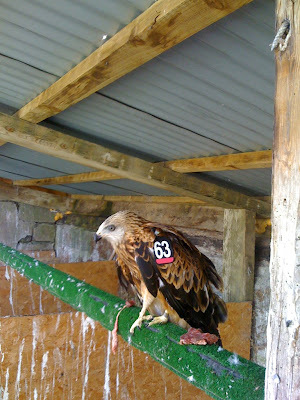 The rehabilitation unit has just one resident now as the young buzzard was released back into the wild at the weekend. The red kite chick has recovered the ability to fly and is eating on its own so will soon be able to join its wild brethren. The last 10 days of sunshine have meant very unreliable feeding times for kite watchers. Today the weather was much 'fresher' and kites were waiting for 3pm. As I put out the first shovel of meat a kite swept in and took its prize. As I left the field many more descended and so ended the 'drought' of the last week or more. Over the last 10 days the kites have been coming in anywhere from 3:20 to 5:30. None of which was helpful for our visitors, some of who had a long journey ahead. 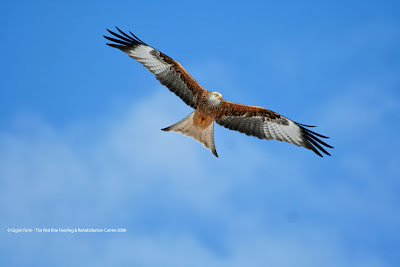 Tomorrow, will the kites be on time - well we will see what happens as the forecast is for spells of sunshine. The kites were late again today. Nothing as late as Thursday, but they still maintained their distance from the hides until around 3:30pm when a couple of dozen birds came swooping through. As I have mentioned before, the warm weather is the reason behind this. 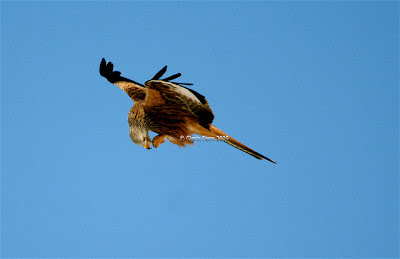 The majority of the red kites were high in the heavens until the day began to cool, where upon they sank back down to the field. 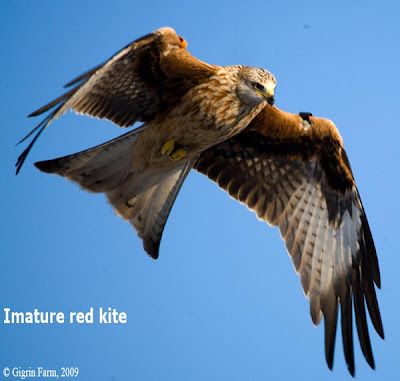 The smaller kite centres are seeing the same effect only more so as the numbers of kites normally seen there are much smaller to start with. Following the increase in blood pressure, caused by the non arrival of the kites yesterday, it was not without some trepidation that I put out the food at 3pm today. 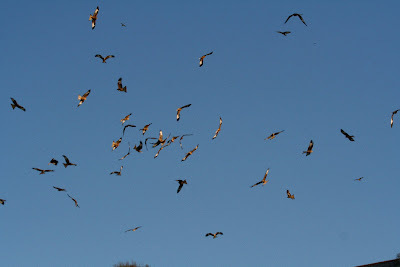 I needn't have worried as just 2 minutes later the kites began descending. A raven was the first bird on the field and that helped things enormously. A far cry from what we all endured yesterday. There were gaps between the kites again, but nothing to worry about, and the birds just looked fantastic in the sunshine. The weather was fine, hides were full of expectation, the food was put out for the kites at 3pm and.. and.. where are the kites! It was nearly an hour before the first birds arrived and then not in great numbers. The only consolation being this summers rare sun picking out the vibrant colours of these birds. A long afternoon spent seeking fleeting sightings was far from the amazing spectacle that has been the norm. It was almost 5:30 before the wave of red kites came pouring in for their food and most of our visitors had long gone by then. The day had now cooled so the birds could no longer soar in the thermals. This summer, such as it has been so far, has not allowed the kites much in the way of updrafts and thermals. Its been more in the way of which is the lightest shower in which to fly, so I don't suppose we can really blame them for stretching their wings when these the rare opportunities present themselves..
Will the kites be on time? I've no idea, but the food will go out at 3pm, just as it has every day for the past 16 years. The red kite chick is now feeding itself entirely on its own but still has twist in its left foot. 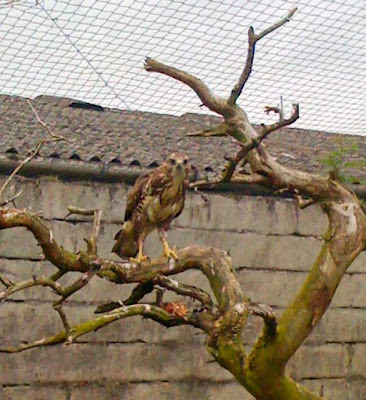 It can fly and has been right up to the netting screen and the immature buzzard is 'ready to go' but is still keeping the kite chick company to date. The Adult buzzard is no longer with us. Not always knowing which day of the week it is, due to the rolling 7 day working week, I'm often surprised when groups turn up, despite the pre booking required. 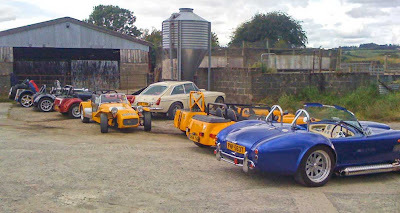 One such surprise was the Lotus car club. Ten such cars rolled up and added a welcome splash of colour to our concrete car park.